patient-centeredness, and integration of evidence into practice. To focus and speed the work of testing improvement strategies, Research Priorities, were set. These were based on environmental scans, literature reviews, major health care organizations’ priorities, and a survey of stakeholders. 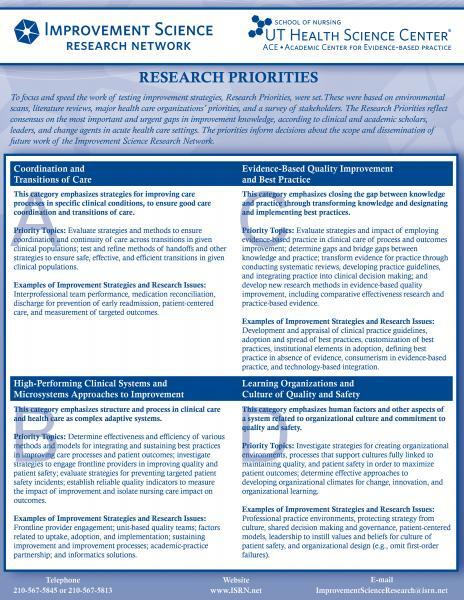 The Research Priorities reflect consensus on the most important and urgent gaps in improvement knowledge, according to clinical and academic scholars, leaders, and change agents in acute health care settings. The priorities inform decisions about the scope and dissemination of future work of the Improvement Science Research Network. This category emphasizes strategies for improving care processes in specific clinical conditions, to ensure good care coordination and transitions of care. Priority Topics: Evaluate strategies and methods to ensure coordination and continuity of care across transitions in given clinical populations; test and refine methods of handoffs and other strategies to ensure safe, effective, and efficient transitions in given clinical populations. Examples of Improvement Strategies and Research Issues: Interprofessional team performance, medication reconciliation, discharge for prevention of early readmission, patient-centered care, and measurement of targeted outcomes. This category emphasizes structure and process in clinical care and health care as complex adaptive systems. Priority Topics: Determine effectiveness and efficiency of various methods and models for integrating and sustaining best practices in improving care processes and patient outcomes; investigate strategies to engage frontline providers in improving quality and patient safety; evaluate strategies for preventing targeted patient safety incidents; establish reliable quality indicators to measure the impact of improvement and isolate nursing care impact on outcomes. Examples of Improvement Strategies and Research Issues: Frontline provider engagement; unit-based quality teams; factors related to uptake, adoption, and implementation; sustaining improvement and improvement processes; academic-practice partnership; and informatics solutions. This category emphasizes closing the gap between knowledge and practice through transforming knowledge and designating and implementing best practices. Priority Topics: Evaluate strategies and impact of employing evidence-based practice in clinical care of process and outcomes improvement; determine gaps and bridge gaps between knowledge and practice; transform evidence for practice through conducting systematic reviews, developing practice guidelines, and integrating practice into clinical decision making; and develop new research methods in evidence-based quality improvement, including comparative effectiveness research and practice-based evidence. Examples of Improvement Strategies and Research Issues: Development and appraisal of clinical practice guidelines, adoption and spread of best practices, customization of best practices, institutional elements in adoption, defining best practice in absence of evidence, consumerism in evidence-based practice, and technology-based integration. This category emphasizes human factors and other aspects of a system related to organizational culture and commitment to quality and safety. Priority Topics: Investigate strategies for creating organizational environments, processes that support cultures fully linked to maintaining quality, and patient safety in order to maximize patient outcomes; determine effective approaches to developing organizational climates for change, innovation, and organizational learning. Examples of Improvement Strategies and Research Issues: Professional practice environments, protecting strategy from culture, shared decision making and governance, patient-centered models, leadership to instill values and beliefs for culture of patient safety, and organizational design (e.g., omit first-order failures). The Improvement Science Research Network is dedicated to building a foundation for Comparative Effectiveness Research in Improvement. 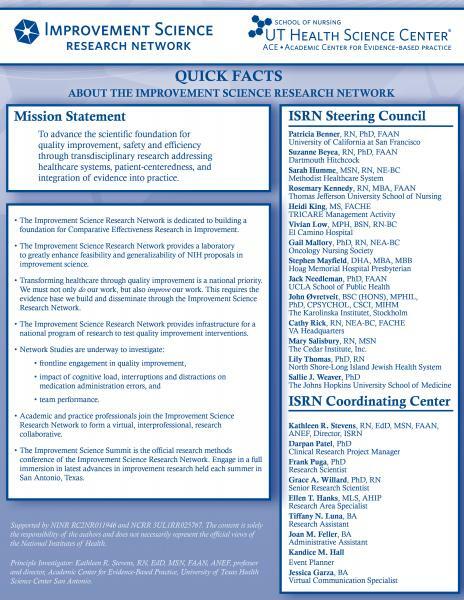 The Improvement Science Research Network provides a laboratory to greatly enhance feasibility and generalizability of NIH proposals in improvement science. Transforming healthcare through quality improvement is a national priority. We must not only do our work, but also improve our work. This requires the evidence base we build and disseminate through the Improvement Science Research Network. The Improvement Science Research Network provides infrastructure for a national program of research to test quality improvement interventions. Academic and practice professionals join the Improvement Science Research Network to form a virtual, interprofessional, research collaborative. The Improvement Science Summit is the official research methods conference of the Improvement Science Research Network. Engage in a full immersion in latest advances in improvement research held each summer in San Antonio, Texas.